It’s that time of year. Time to pick a winner for our S.O.N.A.R program. 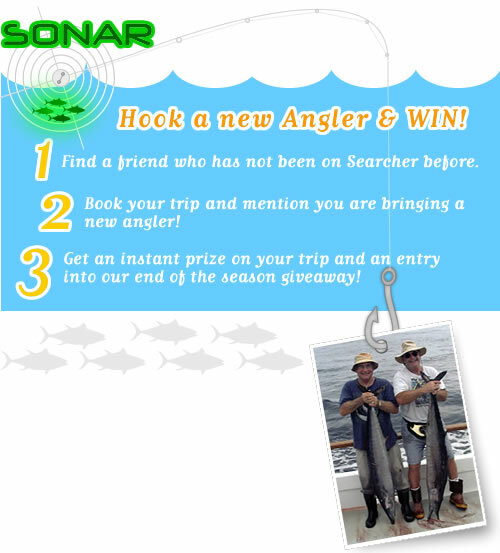 Our S.O.N.A.R program is when you bring a friend on a trip you get prizes and you also get a chance to win big at the end of the year. Captain Art is giving us the run down of the killer set up from PENN fishing that one lucky angler will be taking home. This year one lucky angler will receive this PENN Fathom 2 speed reel and a PENN Carnage II rod. (Rod and reel are a $480 retail value.) Our S.O.N.A.R winner gets this killer set up and a 3day trip for the 2019 season. We will pick a winner next week. Stay hooked up to see who wins. With the Searcher it really does pay to bring a friend.